A gorgeous take on an old traditional dessert. The crumb makes such a difference – this is yum! CRUMB : take your bread and rip into shreds or pop in a food processor and pulse to a crumb. Gently, heat the oil and butter in a pan, when bubbling toss in the breadcrumbs and fry until golden and crispy (you’ll know because they make a rasping noise in the bottom of the pan). Remove from pan and set aside until read to assemble. 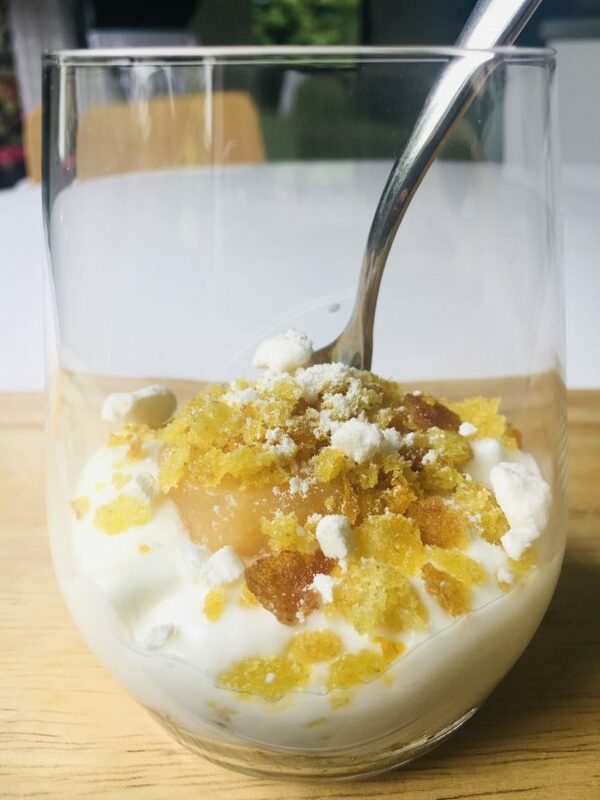 MESS : Mix together the yogurt, zest, juice and ginger with 3 quarters of your crushed meringue. So you finish with a nice textured top. Jax Says : this zesty, gingery mash up is so refreshingly delicious, a fabulous take on an old fashioned staple. For dairy free, look for whipping coconut cream. This is also great if you’re creating a dessert bar, as it looks incredible in layers in a shot glass – ding! dong!